On my first visit to Amsterdam, I took the train to Haarlem to see the Frans Hals Museum. As I exited the station, I passed through the Grote Markt. There were stalls bursting with colorful bouquets, tables laden with fresh baked goods, a dazzling array of local meats and cheeses, and even clothing. I shopped with the locals and bought a bag of scones, fresh cheese, and pashminas in unique colors and textures. My first European market experience was a success and I was hooked. Nowadays, rather than stumble upon local markets, I actively seek them out wherever I travel. Many towns have a central market square where they typically hold their markets, but you’ll find others held indoors or in a permanent location. Products vary by country and region, but they always seem to carry local produce and flowers. Depending on where you are and how frequent you go to the market, you might also find meats, cheeses, spices and seasonings, handmade jewelry and crafts, clothing items, and botanicals such as soaps and lotions. Don’t be surprised if the stallholder just happens to have farmed or crafted your items. What treasures have I found? Silver and red coral jewelry and all things lavender in Aix en Provence, Italian spices and seasoning mixes in Rome, pistachio cookies in Sicily, paprika and hand-embroidered linens from Budapest, and distinctive custom-made hats from Sydney. Prices tend to be reasonable and it’s fun to meet the stallholders and artisans. One caveat; bustling markets can be a haven for pickpockets so be careful. 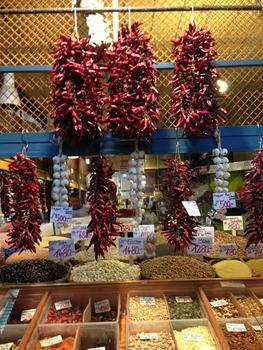 Held every morning, this market is known for its colorful produce and flowers, cheeses, olives, herbs, and botanicals. Held Saturdays and Sundays featuring unique artisan products, including dresses, hats, and bags, jewelry, and original artwork. On my visit, I was charmed with handmade leather dog collars. Held in different town squares during the week and over the weekend, you’ll find food markets, flower markets, antiques and flea markets, old and secondhand book stalls, and material and clothing markets. 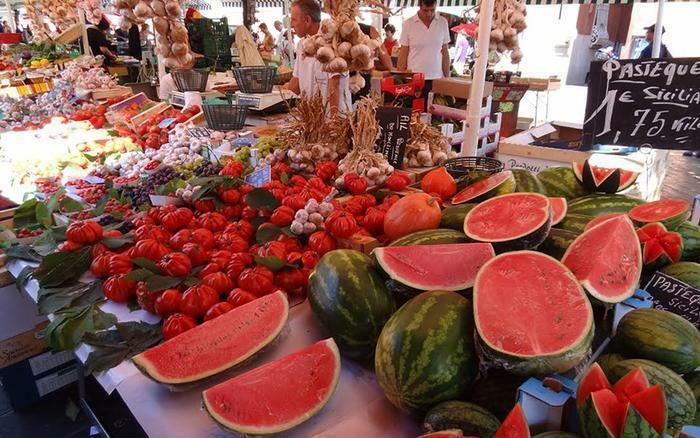 Villages and towns in the Aix-en-Provence countryside hold local markets several times a week carrying fruit, vegetables, flowers, and other goods. Held every day but Monday, this vibrant market features produce, meats, cheese, wine, olive oil, olives, dried fruits, season mixes, prepared foods, and baked goods. Held every day with the widest assortment of goods, you’ll find the traditional fruits, vegetables, and flowers, as well as bread and pizza, clothing, accessories, household goods, cheese, wine, oils, and so much more. I was surprised to see a vendor with a huge selection of felt hats in a rainbow of colors. This is a unique market housed in a restored neogothic hall that can easily overwhelm. The lower level includes grocery, baked goods, and produce items, including colorful peppers and Hungarian sweet paprika, available in all sizes and packaging. The upper level features Hungarian souvenirs, including leather goods, scarves, and traditional folk art in clothing and table linens. Whether you choose to shop in local markets or just browse, you’ll leave with a better understanding of the people and flavors that make up the locale.